Shoulder protection rib provides protection against rapid shoulder wear. Visual Alithnment Indicators (VAI) alert user to tire tracking problems. Scuff ejection system reduces stone retention. 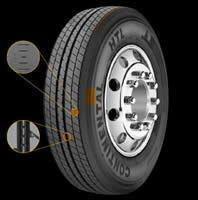 13/32 tread depth minimizes tread squirm and irregular wear.